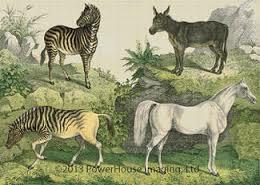 The horse family is a small one, which includes only horses, donkeys, mules and zebras. Many members of this family are extinct. Modern horses are beloved family pets, but horses were originally kept only for their ability to work. Horses are strong and smart. Before cars were invented, they pulled carriages and wagons or people rode them. They were also used to pack things on their backs. All About Horses: The horse family is a small one, which includes only horses, donkeys, mules and zebras. Besides the tame horses we know and love, several wild horses exist, including zebras and the American mustang. 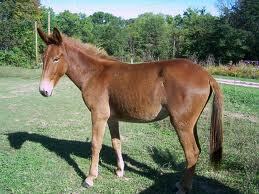 Mules are a cross between a donkey and a horse. American mustang belongs to horses family. Horses have only one hoofed toe on each foot. Horses are related to rhinos and tapirs. Horses are known for their long legs. They can walk, trot, jump and gallop. People tamed horses about 4,000 years ago. Horses sleep only about three hours each day. Horses often sleep standing up. This trait allows wild horses to get away from predators quickly. 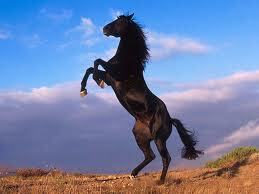 Horses can run up to 50 mph for short periods. Mules are a cross between a donkey and a horse. 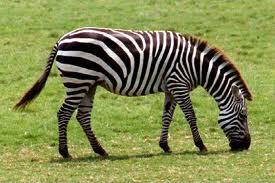 Zebras also belong to Horses family. A video display of a talented trained horse. Question: How can you tell a horse’s age? Answer: Look at his teeth. The older the horse, the more worn down the teeth. Question: Do horses have good eyesight and hearing? Answer: Horses can see almost all the way around them. They can’t see above their heads, which is why they don’t like to be touched on the tops of their heads. Their long ears hear well. Horses fold their ears back to show they are angry or scared. Enjoyed the Easy Science for Kids Website all about Horses info? Take the FREE & fun Horses quiz and download FREE Horses worksheet for kids. For lengthy info click here. Declan, Tobin. " Fun Horse Facts for Kids ." Easy Science for Kids, Apr 2019. Web. 23 Apr 2019. < https://easyscienceforkids.com/all-about-horses/ >.